Everyone knows the perfect composition of shortbread – simple, crisp, buttery. Combine the right amount of flour, an abundance of butter, a whisper of sugar and a hint of salt and you have a delectable cookie that would please anyone anywhere. Given my penchant for oatmeal, I just had to take it one tiny step further. However, the same results obtain. Because the oatmeal is ground with the flour, you still wind up with a crunchy, crumbly cookie rather than a chewy one. 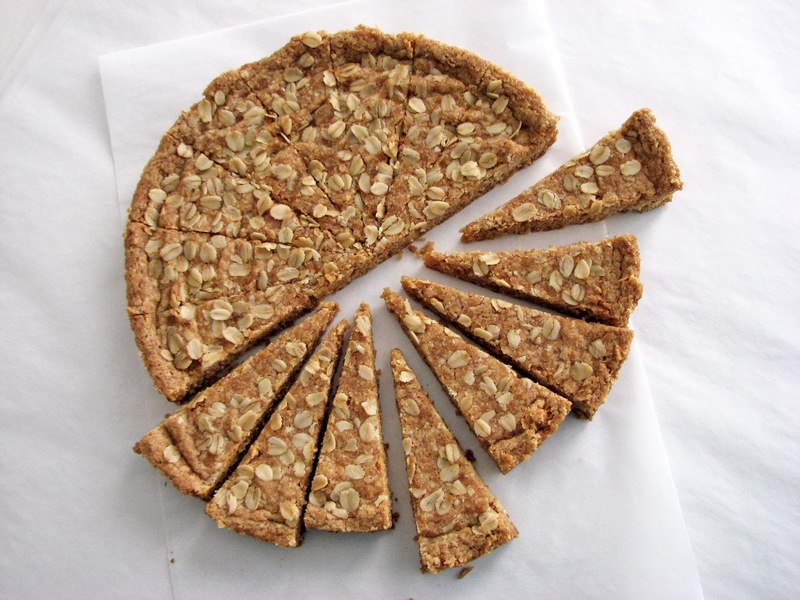 And the lovely oat flavor is all there, especially when you invite oatmeal’s famous lover, brown sugar. What I like about these cookies is that they are very light and have no heavy after effects, even if you eat two. If you’re in the mood to go back to the basics, this is a uniquely satisfying cookie. It’s so easy to make that you will find yourself looking for excuses not to bake another tray. It would go well as the centerpiece for a gathering of friends at the table or as one of the featured guests at a beautiful brunch or as the best gift for a friend in need. 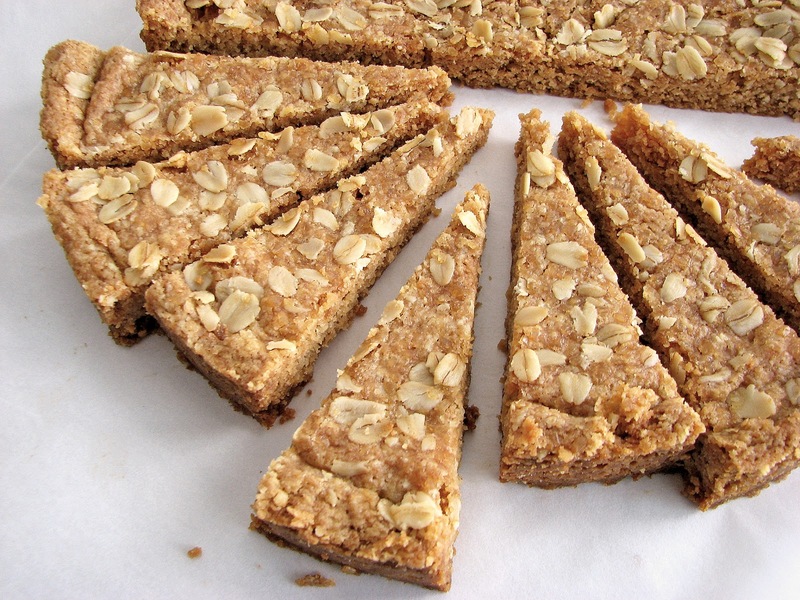 - This shortbread is baked for a long while at a low temperature. 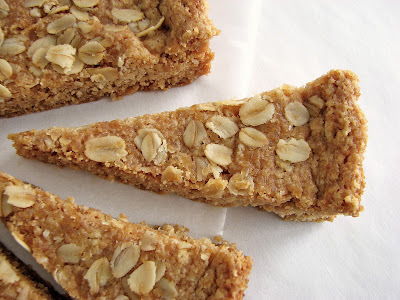 This allows for a nice toasty flavor and a crispy crunchiness that is typical of delicious shortbread. Unlike classic shortbread, this version does take on some color. - Salt is very important to keep oatmeal from tasting flat. - I used an 8” tart ring. You can also use a 9” tart pan or square pan, just check it the last few minutes. The top should be firm to the touch. If you happen to underbake the shortbread, cut into pieces and toast in the oven for an additional few minutes. - Scoring the shortbread when it comes out of the oven and cutting into pieces with a very sharp knife while it is still warm will give you nice clean slices instead of jagged shards. Or, if you are in the mood for savagery, break it into pieces with friends as you would the astonishing Italian Almond Sbrisolona. - I might be tempted to add a bit of espresso powder to the mix next time. If you’re crazy about cinnamon, you would also enjoy it here. - If you're a fiend for oatmeal, you'd probably also enjoy Oatmeal Ice Cream, Oatmeal Banana Cake or Oatmeal Shortcake with Plums. Preheat the oven to 325 degrees. Lightly grease an 8” tart pan. Place the flour, oatmeal and salt into the bowl of a food processor and process until the oatmeal is finely ground. Add the sugar and blend. Add the pieces of cold butter and vanilla and process until the mixture comes together in clumps around the bowl. Gently press the mixture into the pan, making sure it is evenly spread. 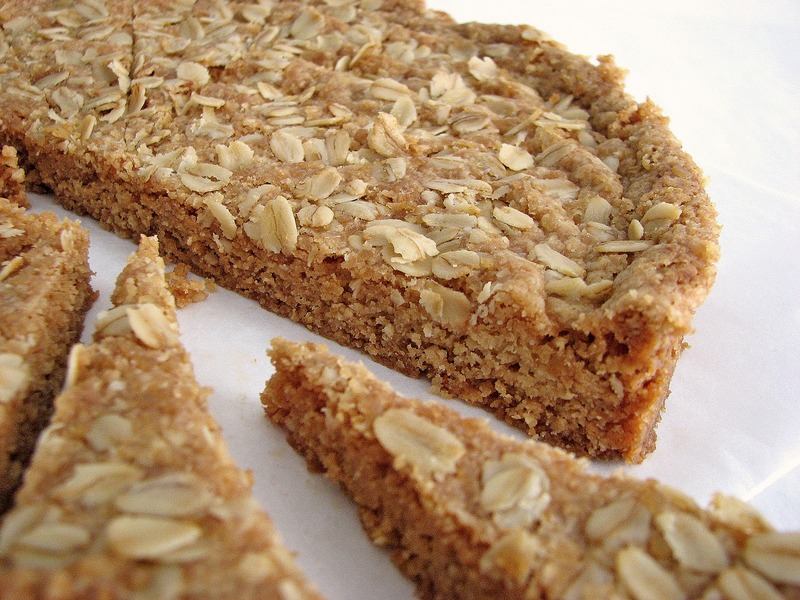 Sprinkle a smattering of oats and then raw sugar over the surface and gently press into the surface. Bake the shortbread for 60 minutes. As soon as you remove from the oven, take the point of a sharp knife and score the top into serving pieces. Cool the shortbread in the pan for 10 minutes. Remove from the pan and gently slice into pieces while still warm. One of the things I love about chocolate is that it’s almost impossible to know everything about chocolate. It will dare you, surprise you and kick you back. It will sometimes haunt you at the oddest hour. And it will definitely retool your notion of what a flavor profile is all about. With so many regions producing amazing cacao beans and blends, there is no end to a new kind of spark we can create in our kitchens. While I must say that chocolate isn’t really my strongest passion in the realm of pastry and desserts, I did have the pleasure of working with some of the world’s finest chocolate products for over a year. I consider myself very lucky to have an indelible memory of tasting a Pralus Vanuatu bar (now extinct) and thinking I was in some sort of crazy-happy alternate universe. And although I never really settled into a friendly affinity for working incessantly with chocolate at the exclusion of all other things, I do appreciate its vast ability to stir the deepest longings in so many people. I seem to veer mostly toward fruit, but I have a grand respect for chocolate in all its delicious confoundings. So it was in this spirit that I forged ahead with this incredibly surprising recipe for Chocolate Rum Raisin Cake. Oh my. This cake turned out to be one of those experiments that blew my mind when I had a chance to taste the results. I started out wondering how all these ingredients would co-mingle, not entirely sure this would work. I know that extra virgin olive oil is a tremendous pairing with chocolate, but I wasn’t sure how all the other ingredients would meld in combination. Much to my surprise and great pleasure, this cake turned out to be much more than the sum of its parts. All I can say is, wow! This is a fabulous cake. I know there are many who absolutely fear the raisin. 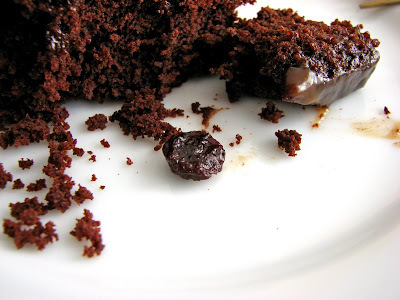 Maybe they were handed a stale box of Raisinettes as a teenager or never got to try Rum Raisin Ice Cream on a dare, but when these raisins are nestled with chocolate and rum in a lusciously moist and transcendently delicious cake, I think they just might become converts. All these ingredients are in delectable balance. 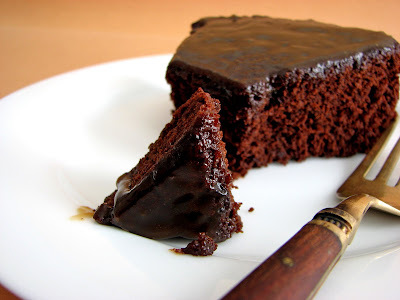 The overwhelming flavor is a deep rich chocolate due to the use of cocoa powder. The cinnamon and rum do not in any way overwhelm and the extra virgin olive oil brings just the right note of earthy flavor and acidity – an absolutely blissful surprise. The raisins also add to the earthy richness. The Brown Sugar Rum Glaze takes it to another peak level of delicious mind-numbing goodness. Do not leave out the glaze! Fresh from the oven, as all kinds of powerful aromas waft and swirl and linger, I'm reminded again of the spellbinding effect of such terrific natural ingredients. Treat yourself to this cake and discover something new about chocolate! - I use California Olive Ranch Arbequina extra virgin olive oil, an amazing product that also comes highly recommended from the test kitchen of Cook’s Illustrated. It’s got a stunningly clean and pure fruity taste without any trace of bitterness and it has an aroma that fills your kitchen with incredible lusciousness. - Make sure your raisins are soft and plump. - My cake baked in 32 minutes. Start checking at about the 30-minute mark. - OK, if you’re in terror of raisins, try the cake without them! Preheat your oven to 350 degrees. Prepare an 8” x 3" cake pan with oil and parchment. Plump the raisins in the rum until very soft. Stir cocoa and water together until thoroughly blended into a paste. Whisk together the olive oil and the sugars. Add egg and blend well. Whisk in the cocoa mixture. Drain the raisins and combine the rum with the buttermilk and vanilla. Gently add dry ingredients in 3 additions, alternating with buttermilk and beginning and ending with the dry ingredients. Fold in raisins. Be careful not to overmix. Pour into prepared pan and smooth batter evenly. Bake for 30 - 34 minutes or until a toothpick tests with a few moist crumbs adhering. Cool 10 minutes. Run a thin bladed knife around the edges to loosen and turn out the cake. Cool completely. When the cake is cooled, prepare the glaze. Melt the butter in a saucepan over medium heat and combine with the brown sugar. Lower heat a bit and cook for 2 minutes. Then add the cream and continue cooking for another 2 minutes, stirring constantly. Remove from heat and add the vanilla and rum. Add a pinch of salt to taste. Cool for just a couple of minutes to lukewarm. To glaze the cake, transfer the cooled cake to a serving plate. 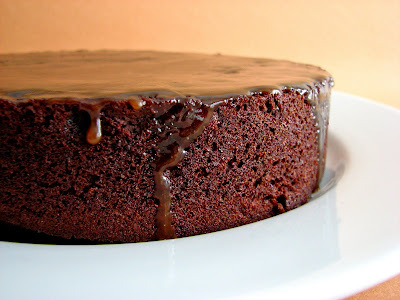 Pour all of the glaze quickly over the center of the cake. Tilt the plate carefully to distribute the glaze to the edges of the cake or use a small metal spatula to spread the glaze, if necessary. It wasn’t until just a few years ago that I realized how much I enjoyed the caramel deliciousness of dates, especially when combined with other balancing ingredients like cheese or citrus. Such rich ancient jewels of fruit surely belong on our tables and in our recipe repertoire from time to time. Among all the varieties, Medjool dates are considered the largest, plumpest and most prized and should be readily available in your area. Dating back to Egypt in the 5th century BC, dates were transported by the Moors to Spain and thrived throughout the Middle East and the Mediterranean. Medjool plantings originating from Morocco and Jordan are now cultivated in the Coachella Valley of California. I find the most beautiful specimens at my local Farmer's Market. This ice cream captures the lovely balance of caramelized spiced dates and the bright citrus acidity of oranges. The dates are cooked for a few minutes with a splash of sherry, cinnamon and orange zest to bring out their creamy quality. This compote is then folded into an orange ice cream for a perfect contrast. Once a spoonful lands on your palate, each co-mingling of ingredients reveals itself in perfect order. 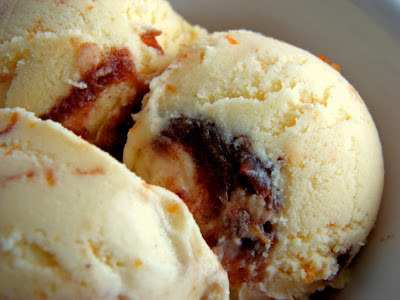 As we drift into a welcome season of spring fruit and flowers, Orange Date Ice Cream helps to bridge the waning days of winter and the sunny promise of lots of new spring ice cream recipes to come. - You may sometimes see a white powdery film forming on the surface of dates. This is due to their high level of natural sugar and is not a cause for alarm. It’s just sugar crystal formation. You can warm them in the oven or steam them and the crystals will dissolve. - I used a Lustau Amontillado Los Arcos Sherry. It has a nutty bouquet and just the right amount of dryness and sweetness. I also think a Rainwater Madeira, with its caramel, orange and hazelnut notes, would work very well in place of the sherry. - Salt is a very important ingredient in pastry, especially when it comes to chocolate and citrus. 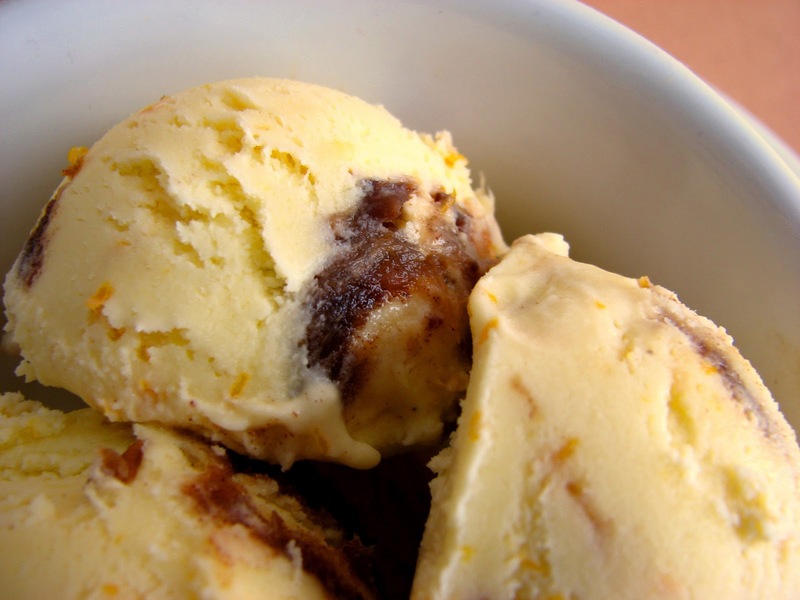 Salt really brings out the truest flavor of orange in this ice cream. Keep adding a few crystals at a time and you'll soon see how significantly it changes the taste. - If you prefer, you can strain out the orange zest just before you spin the ice cream. I left it in because I don't mind it and I like the splash of color it adds for plating and photos. - If you don't happen to have Grand Marnier on hand, go ahead without it. - For an additional textural element, you could also toss in or garnish with toasted almond slices. Place milk, honey and the zest of 2 oranges in a saucepan and bring to a low simmer. Remove from heat and steep for 30 minutes. Combine heavy cream, orange juice and and lemon juice in a bowl with a strainer placed on top. Set aside. Whisk the yolks and sugar until thick and pale. Add warm milk mixture in a steady stream, whisking constantly until combined. Pour mixture back into the saucepan and cook over moderate heat, stirring constantly with a wooden spoon, until mixture coats the back of the spoon. Remove from heat and pour through the stainer into the bowl with the cream mixture. Whisk to combine and cool. Add Grand Marnier and a pinch of salt to taste and whisk until thoroughly combined. Place in a clean airtight container and chill overnight. Chop the dates into small pieces. Place sherry, water, brown sugar, orange zest, cinnamon and salt in a saucepan over low heat. Bring to a slow boil for about 2 or 3 minutes, stirring continuously. Add the chopped dates and lower heat. Cook a few more minutes until the liquid is absorbed. Freeze the orange ice cream base in your machine. Pour about half of the ice cream into a clean container. Dot the surface with half of the date mixture. Pour another layer of the ice cream on top. 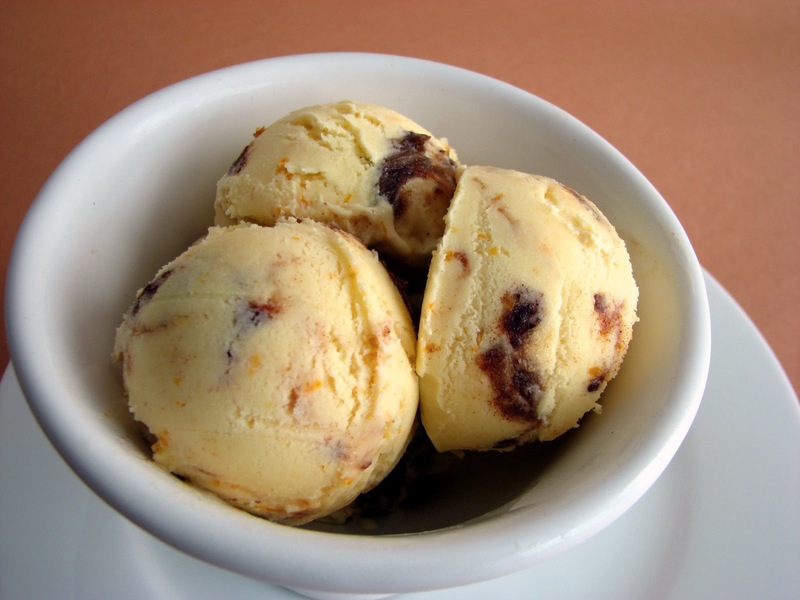 Dot the surface with the remaining dates and use the tip of a spoon to press them down into the ice cream. Press a piece of plastic wrap onto the surface, cover and place in your freezer until firm. I love mousse. I love the light airiness that seems to float off the spoon. I love that it’s such a great medium to showcase simple ingredients. So when I heard about an interesting way to make banana caramel, I immediately thought it might be a great thing to try as the base for a mousse. Caramel syrups and sauces are some of the basic tools of pastry. Making caramel can be tricky until you’ve put in some practice to learn how it works. After working for a pastry chef who used caramel quite a bit to flavor lots of different dessert elements, I really got comfortable with it because I had to make it every day. Since caramel adds such a wonderful flavor to so many pastries and desserts and can be flavored in a number of different ways, I hope you’ll try to master its production. Once you’re able to recognize the size of the bubbles forming on the surface to gauge when it’s ready to color, how quickly it cooks from that point forward and how dark it should go, it’s really pretty simple. 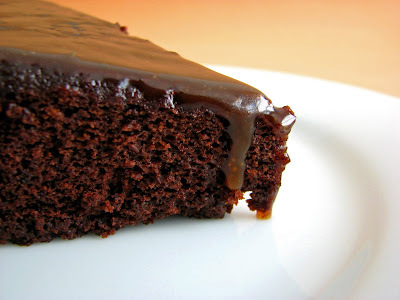 It’s also important to bear in mind the darker the caramel, the less sweet and more complex the flavor. But take it too far and it will taste burnt and bitter. • I use medium high heat and watch it closely. • To prevent crystallization, have a glass of water and a pastry brush handy to wash down the sides of the pan a couple of times as the sugar is heating up. • Once caramel starts to get near the right color, there are 2 ways to stop the cooking process: from below and from above. To stop the cooking of caramel from below, you can set the bottom of the pan in ice water to cool off the pan. However, it will stop cooking much faster if you cool from above, which means adding another ingredient, such as room temperature cream or water. For caramel syrup, you would add water. For caramel sauce you would add various ratios of cream and butter or orange juice, liquor, cider or other flavored liquid. You can expect the mixture to expand and sputter quite a bit for about a minute, so caution is in order. Wear an oven mitt or rubber glove if you’re worried about getting burned from the caramel or from the steam. The other important thing to remember about caramel is never turn your back on caramel once it begins to show the slightest hint of color. For better control, I like to let it get to a medium amber or honey color and when it starts to smoke, I take it off the heat. At this point, the temperature of the caramel is so high that it will continue to cook, darken and smoke. When it looks like it’s reached the right color after about another minute or so, I add the next ingredient to stop the cooking. • If you’re adding an ingredient to stop the cooking, make sure the pan is big enough to contain the expansion and sputtering. • Ingredients added to stop the cooking should be at room temperature to avoid seizing the caramel. • If you're adding cream, you can steep with spices for additional flavor. Vanilla or liquor also add flavor and should be added last, always off the heat. • Salting – I think salt is an important ingredient in good caramel. Add to taste when the caramel has cooled. • Always remember that you are cooking the sugar to a very, very high temperature. Caramel burns are quite painful because the cooked sugar will stick to your skin. Always use an abundance of caution. 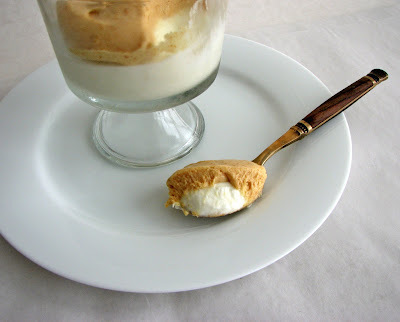 • Caramel syrups are handy to have on hand for flavoring ice cream, sauces, custards and lots of other dessert elements. The sugar to water ratio is 1 to 1. You cook the sugar with just enough water to moisten and then add the rest when you want to stop the cooking. • Storing - Refrigerate and keep caramel sauce for about 3 weeks. Caramel syrup will keep for quite a long time. To make Banana Caramel for this recipe, some very ripe bananas are pureed and used to stop the cooking of the caramel. The mixture bubbles up and sputters vigorously but smoothes out nicely. If you’re a fan of bananas, you’ll enjoy this combination. 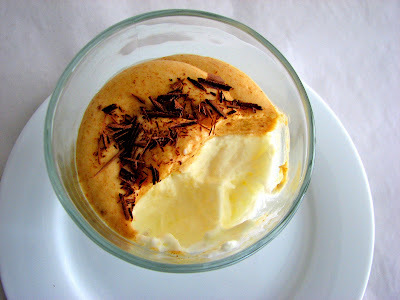 Since the Banana Caramel Mousse is quite rich, I pair it with a plain Yogurt Mousse. They complement and balance each other quite well. - To prevent clumping when blooming gelatin, always sprinkle it slowly into cold water rather then pouring cold water on the powder. I prefer sheet gelatin, which comes in 2 strengths (silver and bronze), but I recognize that most home cooks use powdered. - Be sure your bananas are quite ripe. The skins should have plenty of brown spots and the bananas should be quite soft with a strong scent of ripeness. 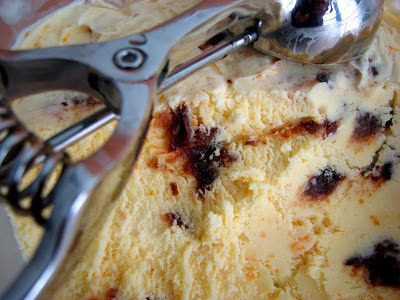 - The chocolate shavings really add to the flavor, so don’t skip this garnish. 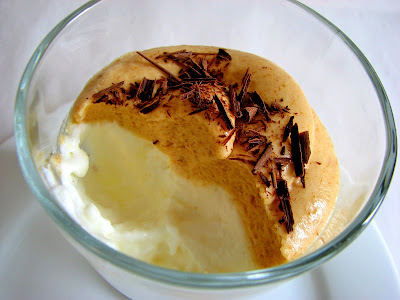 - If you enjoy mousse, be sure to try Herme’s Chocolate Mousse, a supremely amazing dessert. For the yogurt mousse, whisk together the yogurt and sugar. Add the lemon juice. Bloom the gelatin in a small bowl with 1 tablespoon of cold water. Whip the heavy cream just to a very soft peak. Liquefy the gelatin by placing the bottom of the bowl in a pan of simmering water. Add the gelatin to the yogurt mixture and blend thoroughly. Pour the Yogurt Mousse into a serving dish or 6 individual parfait glasses. Chill for about 1 1/2 hours or until set. To make the banana caramel, puree the 2 ripe bananas until they are the consistency of a smooth pancake batter. Pour into a bowl and set near the stove. Whip the heavy cream just to a very soft peak and keep in the refrigerator. Bring the sugar and water to a boil in a saucepan. Continue boiling until the sugar starts to turn a medium amber color. Pull off the heat and let it continue to darken a bit more. Once it reaches a medium dark caramel, carefully pour in the pureed bananas. Stir with a long handled utensil like a wooden spoon until thoroughly combined. If there are any clumps of caramel, return to low heat until the clumps are melted and the mixture is smooth. Remove from heat and add butter, vanilla and salt to taste. Add gelatin to banana caramel and let sit for a few minutes to begin to firm up just a bit, stirring occasionally. 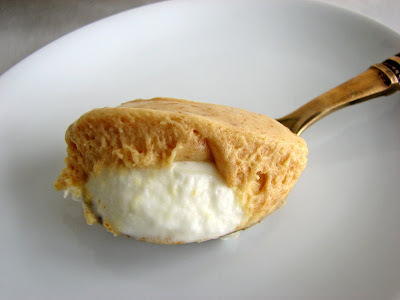 Fold whipped cream gently into caramel-gelatin mixture until streaks disappear. Pour over Yogurt Mousse and chill for a couple of hours until set. To serve, garnish with chocolate shavings.